Greetings! I’d like to take this opportunity to wish you and your families a happy Thanksgiving. One of the things that I am most grateful for is the continuing support of my artists and clients for the 38 years I have been in business. My life is enriched beyond measure by all of the wonderful relationships formed over the years in the glass community. This month I have chosen some wonderful pieces to share with you. I have just met with Lino in Seattle to choose new inventory and I look forward to sharing that body of work with you in the December edition of Holsten Galleries News. If you are interested in a preview, please let me know. "Art must be an expression of love or it is nothing." 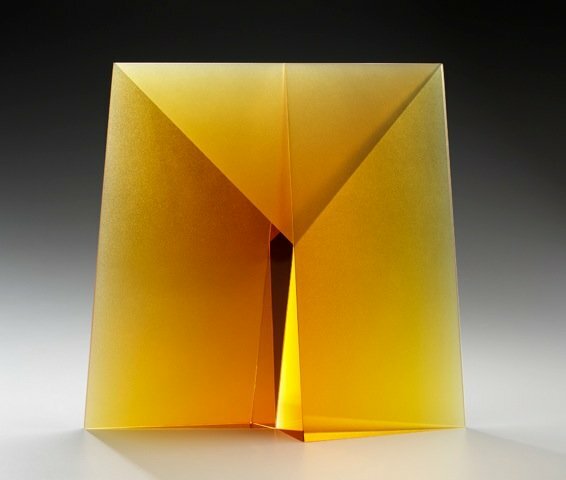 This new glass sculpture by Martin Rosol is subtle and understated and at the same time dramatic in its own quiet way. Its architectural quality typifies most of the Rosol works I have seen over the 30 or so years that I have been representing him. Gila Trout by Charles Miner, 10" x 20" x 4"
Charles Miner is one of a handful of glass artists who render their sculptures in wax and use the lost wax casting system to produce the final object in glass. 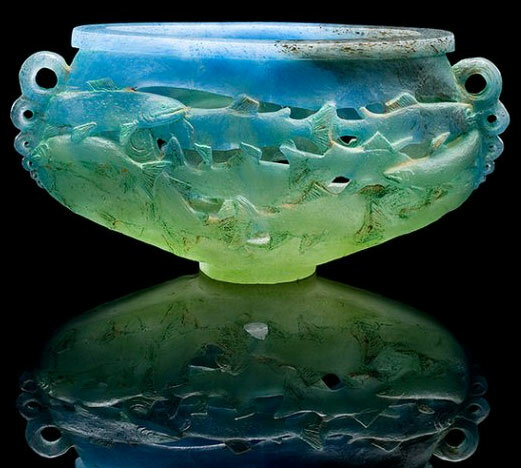 The organic quality of the casting and the patinas used on the surface create a feeling in this piece of something quite ancient that has recently been dug up out of the earth. John Kiley had just finished this piece when I asked him for something new to feature this month. To me it is one of the finest Kiley pieces I have seen to date. 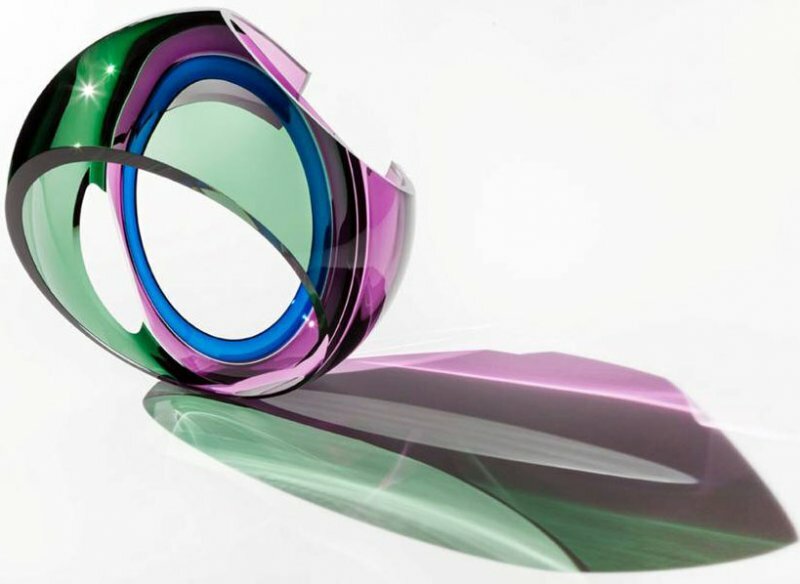 All of the elements of this piece-the form, the use of negative space, the tilt, the wonderful palette of forest green, cobalt and lavender-combine to form a harmonious whole which speaks to John’s artistic and technical mastery. Marin Halo by John Kiley, 14.5" x 14.5" x 14"
As many of you will recognize "Teasing Jupiter Johnson" is from one of Stephen Powell’s older series. 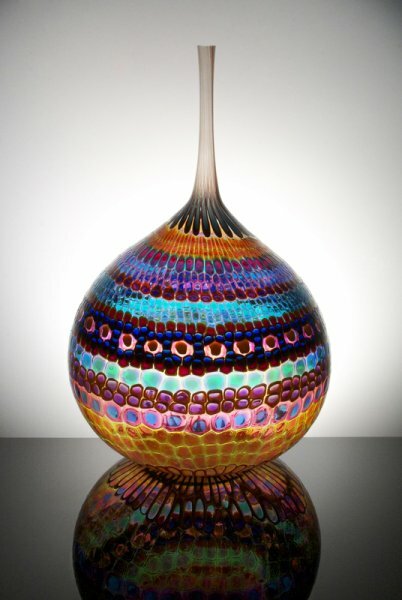 I have chosen to feature it here because I love this form, the murini work and the exotic combination of colors. I particularly love the row of light turquoise murini in the middle of the piece which creates an artistic tension between the top and the bottom of the sculpture with their more saturated colors. 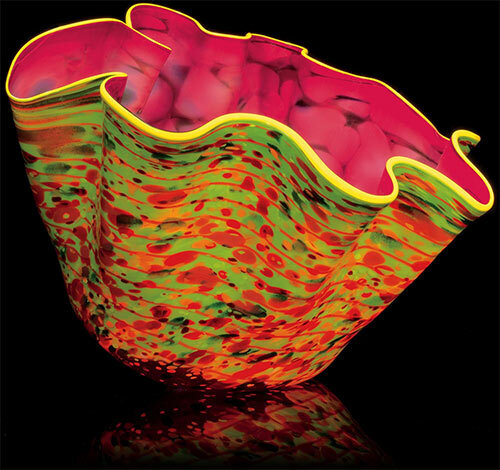 In addition to the four beautiful Studio Editions created by Dale Chihuly this year, there are still some pieces available from previous years’ series. I have chosen to revisit the "Zinnia Macchia" from 2014 because I love the flowing, organic quality of this piece and its exuberant combination of colors. For me this piece has a happy, uplifting feeling. I hope you have enjoyed this month’s newsletter and I look forward to hearing from you with any questions or comments you might have.